Helps the body absorb fat, benefits the central nervous system, maintains a healthy liver, protects against memory loss, helps muscle function, maintains heart health, helps with pregnancy and the health of the child. It improves fertility and helps PCOS and lowers PMS symptoms, helps with mental anxiety, benefits insulin sensitivity, possible therapy for eating disorders, helps with lung conditions and fatty liver. 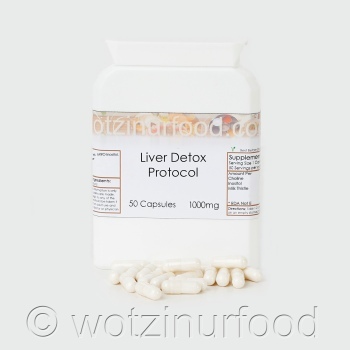 Improves liver function and detoxes the system and benefits fatty liver due to alcoholism, may help lower cholesterol, could help with insulin control and could also help prevent gallstones. It also has anti-aging effects and improves the skin. Do not take if allergic to any ingredients. Processed in a premises which handles nut, seeds and spices. Take care if pregnant or lactating. 50 capsules 00 size. Please note image is for display purposes only, contents may vary.